For most of the first two seasons, Dualla didn't have a real name - she was just "Dualla" or "Dee." It wasn't until Season 2 that her full name was revealed as Anastasia. Of course, in those days her role in the story was basically to repeat things someone said to her, which made her BSG's equivalent to another black communications officer with only one name. 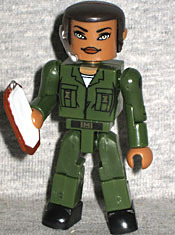 The Minimate sees her in her dark green uniform, which is accomplished entirely through simple paint apps oin the chest and belt. It's very nicely done. She gets a new hair piece, with a little ponytail in the back and a silver microphone/earpiece on the right side. She has one accessory: a Galactica-style clipboard, which actually gets multiple paint apps to make it look realistic. Lee Adama, son of Galactica's commander (and later admiral) was eventually romantically involved with Dualla, but that's way past the time represented by this set. This is basically miniseries/early Season 1 Apollo, when all he needed to be was an ace Viper pilot, with no sort of political intrigue going on behind the scenes. 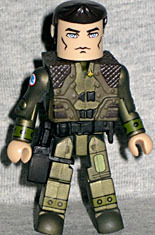 Below the neck, this Minimate is identical to Starbuck: same paint apps, same sculpted vest, same belt and same pistol holstered on his leg. If you pulled the heads off, you'd never know which was which. The likeness isn't terrific, since actor Jamie Bamber doesn't have a head that lends itself to the standard Minimate tube. They tried their best, though. He has a new hairpiece to create his pointy little fauxhawk, and also includes the same flight helmet Starbuck came with. On the plus side, his fits much better: I only had to scrape the paint off the inside to keep it from sticking, not shave off any plastic.